“Musco has been an excellent group of people to work with. They have provided a perfect solution for us at Centre Court. A different sporting venue would require a different solution. For us, they have provided the opportunity to prove their solutions will work before we actually installed them." As one of the premier tennis events in the world, the standards at Wimbledon are unsurpassed. So in 2014, when the decision was made to transition the lighting at Centre Court to an LED system, project leaders knew they needed a highly customized solution capable of adapting to and meeting the facility’s exact needs. Having worked together on Centre Court’s previous lighting system, they were familiar with Musco’s experience and expertise and determined they were the right partner for the project. Officials from the All England Lawn Tennis Club (AELTC) visited the USTA’s Arthur Ashe Stadium in New York City—home of the U.S. Open—to see firsthand the performance of Musco’s Total Light Control–TLC for LED™ technology, which was installed there the previous year. This was just part of more than two years’ worth of extensive research, planning, and testing—which included Musco creating a mock-up of Centre Court’s visual setting at its plant in Muscatine for testing with a television crew from the U.K., and the AELTC bringing in professional tennis players to review the lights after installation—that went into the project. Improved Broadcast Quality – the system’s CRI and superior light control and uniformity achieves optimal direct and indirect lighting on the court for enhanced HD broadcasts. Efficient Playability – with instant on/off capabilities, it negates the need to allow for extra time for the lights to warm up or cool down, making it easier to resume play more quickly. Light Control – Patented light and glare control technology within the TLC for LED™ system virtually eliminates glare for players and spectators. 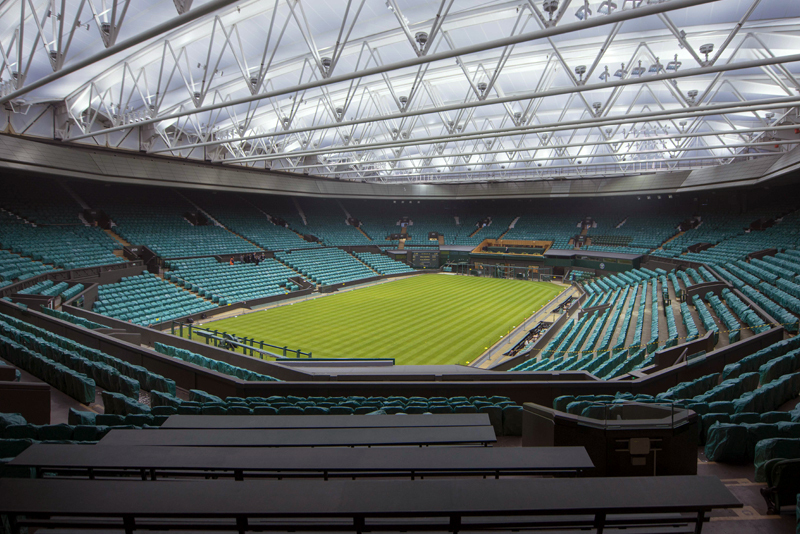 Adaptability – the system was adapted to fit existing mounting structures on Centre Court’s retractable roof, and will be used when the roof is closed. Energy Efficiency – CO2 emissions will be reduced by 687 metric tons over the next decade, which is the equivalent to removing 145 cars off the road for one year. Cost Effective – the AELTC will realize a 10-year ownership savings of more than $204,500. The new TLC for LED system is backed by a 10-year warranty covering parts and labor, relieving the AELTC from having to worry about maintenance, or pay for it, over the long term.